What was it that won James a place among the favorite three? Faith, burning, impetuous and outspoken, the straightforwardness of the true Israelite, were visible in him; but these qualities needed purifying before the Son of Thunder could proclaim the Gospel of peace. It was James who suggested fire from heaven to consume the inhospitable Samaritans, and who sought a place of honor beside Christ in His kingdom. Yet Our Lord, in rebuking his presumption, prophesied his faithfulness unto death. 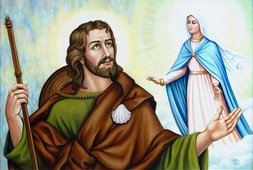 (Mark 10:38-40) He went to Spain after the death of Our Lord, and remained there for nine years, according to tradition. The famous Basilica of Saint James of Compostello, one of the most frequented pilgrimage sites of Europe, the site also of countless miracles, commemorates the memory of the nation's beloved Apostle. In the year 44 Saint James, who was at that time in Jerusalem, was brought before King Herod Agrippa. The Apostle had been preaching fearlessly there, curing the sick and the blind, and delivering possessed persons. Two magicians were sent by the authorities to stop his doings by their charms, but both were converted. His enemies were not defeated by that, however, and paid two Roman captains to incite a sedition during the Apostle's preaching, then seize him as its author. A certain Josias, a scribe among the Pharisees, put a cord around his neck and took him before the third Herod, grandson of the first, murderer of the Innocents, and nephew of the second, who had the Baptist decapitated. This new sycophant of the Roman Emperors, desiring to conciliate the Jews and make them forget his non-Jewish origins, decided to do so by persecuting the Christians. Without delay he condemned Saint James to die by the sword. The Apostle's fearless confession of Jesus crucified so moved the scribe Josias, that he too confessed Christ and begged pardon of the Saint. He was taken with the Apostle to the place of execution, where Saint James and his convert died together. The Apostle won the three crowns of heroism: he is a Doctor par excellence of the Faith, he was the first Apostle to be martyred, and according to Saint Epiphanus and other historians, he always conserved his virginity. He is the patron of Spain. A Spanish author by the name of Tamayo reports fifteen different apparitions of Saint James to the kings and princes of Spain, followed each time by some specific assistance for the benefit of the land. Reflection: We must all desire a place in the kingdom of our Father; but can we drink the chalice which He holds out to each one of us? Possumus, we must say with Saint James  We can!  but only in the strength of Him who drank it first for us.